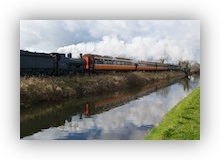 Exactly two weeks ago today (on the 21st of April 2013) the Railway Preservation Society of Ireland (RPSI) ran two steam specials from Dublin to Maynooth and back which they named Royal Canal Shuttles. The name was inspired by the fact that the section of the Sligo line between Dublin and Maynooth runs along the banks of the Royal Canal for almost its entire length. The trains consisted of the RPSI Cravens coaches, and were worked by the RPSI’s 0-6-0 steam loco No.186. The trains were a little more special because No.186’s boiler certificate will expire later this year, so this could well have been the last time she’ll be on this line for a decade or more. Once her certificate expires she’ll have to be fully overhauled, and given that the RPSI is a volunteer group, that will take quite some time. No.186 has proven herself to be a remarkably reliable engine over the last few years, and I’ll certainly miss seeing her around. The weather forecast for the day was awful, but thankfully it turned out to be a little too pessimistic. 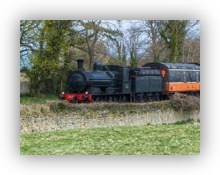 Anyway, on the 5th of May 2012 the Railway Preservation Society of Ireland (RPSI) ran a special train to commemorate Dr. Garret Fitzgerald, who passed away last year. 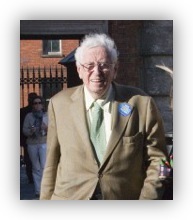 Dr. Fitzgerald was a very well respected former Irish Taoiseach (Prime Minister), as well as a former president of the National University of Ireland, and, a former Vice President of the RPSI. It’s because of this link to the RPSI that the organisation paid him this tribute. I’m still struggling to get up to date with processing my shots, but I am getting closer to caught up than I was a month ago, so things are heading in the right direction at least :). Last time I reported on a steam special (the Maynooth Shuttles), it was to, yet again, say that, despite our hopes, newly over-hauled steam loco No.461 couldn’t make it. Well, that finally changed this time, when she worked her first passenger-carrying train from Dublin in over a decade. She’s not quite running smoothly yet though, clocking up some very significant delays on this rail tour. Still, at least she’s out pulling trains on the main line! I’m still continuing to get caught up with processing and editing my photos and videos from the last few months. 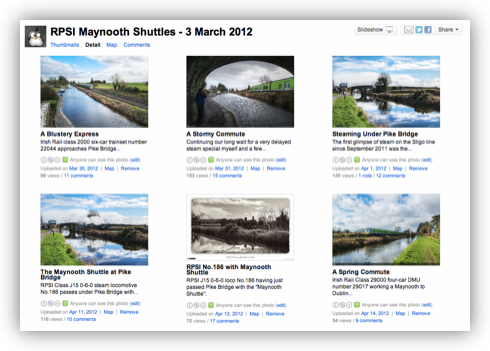 Over the weekend I finished working on the media I shot on the 3rd of March when the Railway Preservation Society of Ireland (RPSI) ran two “Maynooth Shuttle” steam specials from Pearse station in Dublin to Maynooth and back. Having missed the 2011 Santa Specials because of technical issues, recently overhauled ex-DSER (Dublin South Eastern Railway) loco No.461 was suppose to make it’s return to Dublin for these shuttles after a 10 year absence, but, alas, it wasn’t to be. The weekend before the specials she encountered some more technical difficulties on her way from RPSI headquarters in Whitehead near Belfast down to Dublin. No.461 did eventually make it out to Maynooth the next day on an empty driver training run, though even that was not an unmitigated success because she was supposed to run all the way to Enfied, but only made it to Maynooth! Still, by early April she was finally ready, and she worked the Spare Link rail tour over two days (pictures and video coming soon). 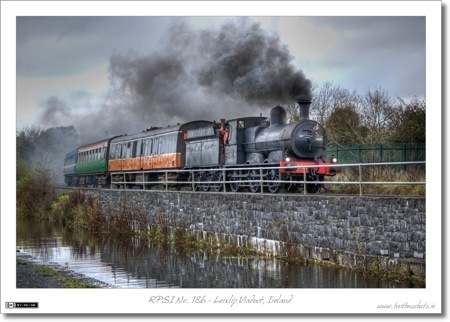 With No.461’s on-going problems, RPSI stalwart loco No.186 stood in for her on the Maynooth Shuttles. Through no fault of No.186 the morning shuttle was over an hour late. Apparently someone had carelessly parked a track maintenance vehicle in front of the turntable in Dublin-Connolly station, so No.186 had to run the whole way around (and partially under) Dublin city to get to the nearest alternative turntable in Dublin-Heuston on the south-side of the city. Still – it was a good day in all, with some lovely sunny periods between some very heavy showers! You can see all my shots from the day on Flickr where I’ve collected them into a set. 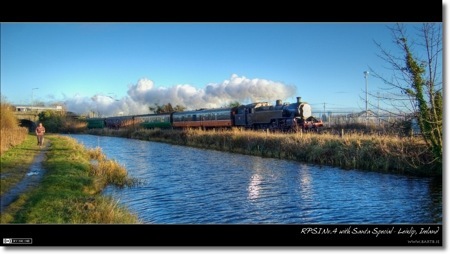 Each year the Railway Preservation Society of Ireland (RPSI) runs two sets of “Santa Specials”, one set operating out of Belfast, the other, out of Dublin. 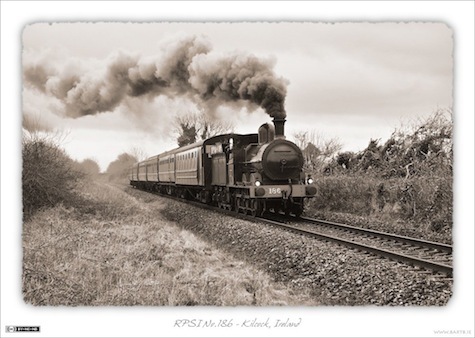 In general, the RPSI try to have two steam trains certified for use one the mainline at all times, one based in Whitehead near Belfast, and one based in Dublin. This means that in general, there is a steam train available to operate each of the two sets of Santa Specials. 2011 was not a normal year though. The venerable steam locomotive No.4’s boiler certificate had expired in the summer, before work was finished on former DESR loco No.461 which was due to replace it. It was hoped that No.461 would be ready to work the Santa Specials from Dublin by December, but it wasn’t to be, she failed to perform on her trials, and had to go back to Whitehead for more work. She’s in service now, but her debut was not until March 2012. This meant that, for a change, the Dublin Santa Specials would be worked by Irish Rail diesel locomotives. This is the last shot I took before my current illness really got serious, and stopped me shooting. I was very much in two minds about whether or not to venture outside to capture this, but, when I realised that the sun would be setting just as the train was coming thought, and that it would be setting in just the right place to light the near-side of the train, I figured I couldn’t miss this rare opportunity. 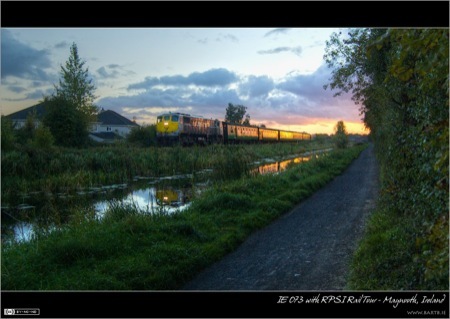 This shot was taken just outside Maynooth, as a Railway Preservation Society of Ireland (RPSI) special was making it’s way back home to Dublin. 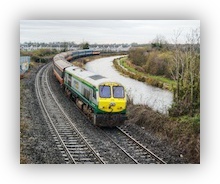 The train was pulled by Irish Rail Class 071 diesel electric locomotive number 073. This class of locomotive were built by General Motors in the late 1970s, and originally introduced as mainline express locomotives. After the introduction of the 201 class of locomotives in the mid 1990s the 071s were relegated to less prestigious lines, including the one through Maynooth form Dublin to Sligo. In recent years these less prestigious intercity services have all switched to class 22000 rail cars, so all that’s left now for the 071s is freight duties and the occasional special. A decade ago, 071s came though Maynooth many times every day, now, since there is no freight service on the Dublin to Sligo line, seeing an 071 here is a real event. This particular 071 has been recently re-painted in Irish Rail’s new freight livery. Originally the 071s carried Irish Rail’s old tan and black livery. The carriages on this special were the RPSI’s heritage set. 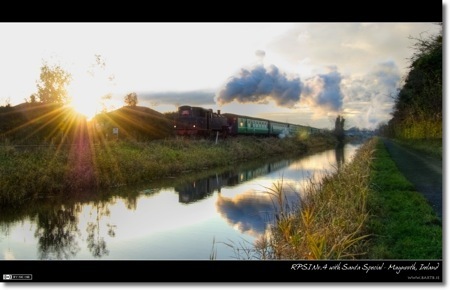 Each December the Railways Preservation Society of Ireland (RPSI) run a series of special excursions called Santa Specials. 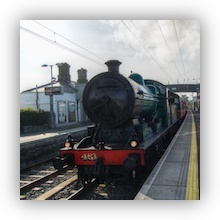 The trains run from Dublin’s Pearse Station to Maynooth and back, and are usually pulled by Steam Locomotive No.4. For three weekends in December there are up to three trips a day on Saturdays and Sundays, so lots of fantastic opportunities to get some shots of steam in action on Irish rails. This year there was a slight hitch on one of the days though, No.4 broke down on the last run on one of the Saturdays, so a Northern Irish Rail diesel loco had to fill in for the runs on the following Sunday, but by the next Saturday No.4 was back in action and was able to finish out the rest of the runs. Since I missed posting a photo last week this is a double week, and I’ve chosen my two very favourite shots from last December’s season of Santa Specials. I have to say I really found it hard to pick just two, I’m really happy with quite a few of my shots from the month. If you want to see more than just these two shots I’ve created a set on Flickr with my best shots. So, on to the first shot, in this case we see No.4 leaving gathering speed as it leaves Maynooth on the return leg back to Dublin Pearse. One thing you’ll note here is that the train appears to be going backwards, or “bunker first”. This is true, except it was designed to run just as well in both directions, so arguably there is no such thing as backwards. It’s this ability to run in either direction that made No.4 such a useful engine during it’s working life, because it could run to stations that didn’t have turntables for turning engines around. In the past all major stations had to have turntables, but very few of those now remain, and Maynooth never even had one because it only became an important station in the 1980s when it became the terminus for the new Western Commuter service out of Dublin. Processing: This shot was generated by tonemapping the original RAW file with Photomatix Pro, and then using layer masks in Pixelmator to selectively blend it with the original to merge the best elements from both versions of the shot into the final image. The second shot I chose shows No.4 on it’s way out to Maynooth running forwards. In this case the shot was taken in Leixlip just outside Leixlip-Louisa-Bridge station. This was No.4’s second run of the day, and this run had the best weather of any of this season’s runs. Processing: This shot was generated by tonemapping the original RAW file with Photomatix Pro.